Makes use of the Mediator Pattern, so you can trigger events around your application. Templating built in - Handlebars is included but feel free to change engines. Follows the Object Literal Pattern with one global namespace, usually ‘myApp’ or ‘chatApp’. In this case, it’s ‘breakingBad’. 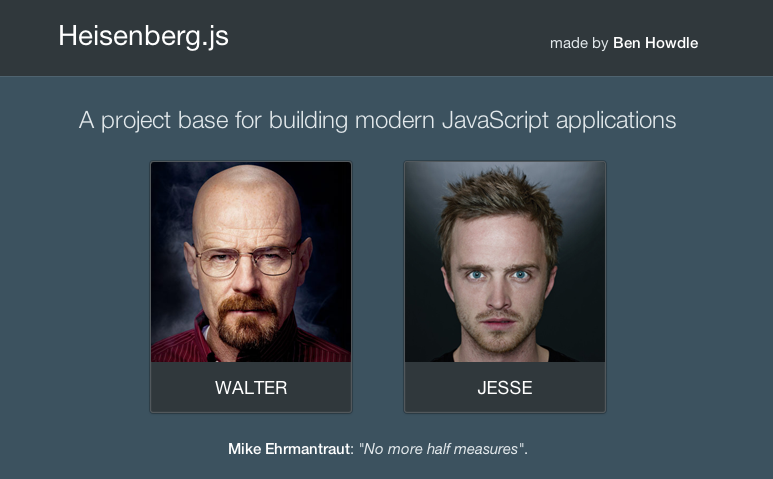 Included: jQuery, Underscore.js and Handlebars. A fully commented source to show you why it’s doing what it’s doing and how to build upon it’s foundation. Whether you use this project in it’s intended manner is obviously completely up to you. It’s basically jQuery but organised into files and Modules. My advice would be to build upon this solid base but feel free to experiment within this architecture and find what works best for you. It’s hosted on GitHub, and has already got a few suggestions for improvements/additions, which I’ll be gladly integrating in the near future.